Obesity is one of the five most common chronic diseases in dogs and cats. The two best ways to combat obesity are portion control and exercise. Regular exercise, including at least one 20 minute walk a day, will go a long way in improving your dog’s health, as well as your relationship with your dog. Longer walks are even better, but be sure to increase your walk time and pace slowly, giving you and your dog time to build your endurance. Some dogs and owners might even need to start with less than 20 minutes daily. Keep in mind, that unless you dog is elderly or in poor health, walking alone may not be adequate exercise, but, it is a GOOD START! 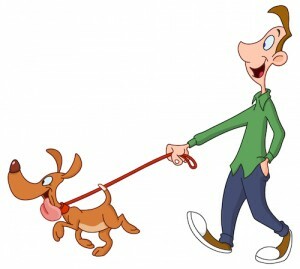 If you’d like more information on walking with your dog, leash etiquette, and walking the exuberant dog, check out The Whole Dog Journal (http://www.whole-dog-journal.com/ ). Enter the term walking in their search engine and you will be rewarded with a long list of the resources they’ve prepared on the topic. Next Article:Heatstroke can Kill – Keep Cool!